Is Now the Right Time for a HomePod Mini? Based on the impressive sales numbers generated by smaller intelligent speakers such as the Amazon Echo Dot and the Google Home Mini, you might think a HomePod Mini is exactly what Apple should be releasing right now. They should definitely be working on it, and more than likely, such a device has already been prototyped in several potential versions. However, despite the potential for a brief sales boost today, I personally think that Apple should hold off on this move for now. The primary reason that the Dot and Home Mini are so popular is because they come with better and more flexible digital assistants. There really isn’t any point in pretending to debate about that. It is acknowledged fact. Neither the Dot or the Mini has great sound quality, but that isn’t what they are designed for. This form factor is made for featuring the digital assistant first and foremost, so it works well for both Google and Amazon right now. Siri may be slowly improving, but it is still well behind, both in terms of what it can do and how well it can do it. These smaller form factor devices don’t offer Apple the same opportunity to feature better sound quality, which would leave them in a tough spot in the market. This is a similar situation to the current Apple TV, which is behind both Roku and Amazon in market share. It is a device with little in the way of true stand out features, and it also costs more, making it an even tougher sell for general consumers. Likewise, until Siri improves, the HomePod is also a device with limited appeal outside of Apple fans and Apple Music subscribers. I won’t deny that Apple would be passing on a short-term sales bump by delaying the release of a smaller form factor device. That said, wouldn’t it benefit Apple to wait until Siri is capable enough to make a small speaker worthwhile? It would be a risk that could result in uncharacteristically poor customer satisfaction ratings and dissatisfaction. Apple doesn’t make that mistake often, and I honestly don’t believe that they will now, either. In the coming months, I hope that they will concentrate on perfecting what they have already released. First they need to get AirPlay 2 and multi-room support tested, working properly, and out the door. Then they need work on expanding Siri’s feature set to a point of near-parity with the iPhone. And for things that aren’t feasible or working yet, adding Handoff capability similar to the Apple Watch would be a welcome addition, as well. If Apple wants to release another home-based product in the short term, it might be better to go bigger than smaller. While such devices won’t bring huge sales, they can more easily be focused on Apple strengths, such as sound quality. One such device that would take advantage of the work Apple has done to create innovative sound experiences, as well bolster one of their other products, would be a soundbar/small home theater setup. An AirPlay 2 compatible device that would seamlessly sync up with the Apple TV would likely prove to be popular among those who already own one, and might actually generate some additional sales. 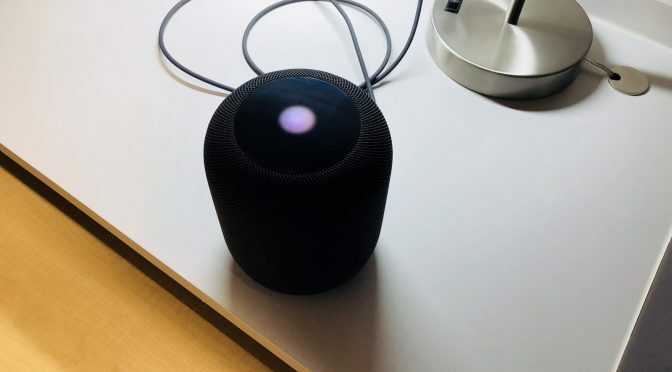 If Apple were to include the same room scanning features and speaker tech found in the HomePod, with the addition of a wireless subwoofer, that would be a strong device. The only thing that would hold such a device back would be if Apple were to forego any form of wired audio input and output, as it would limit it to Apple playback only. That’s probably a bridge too far for a home theater product. However, if they did include at least include a digital audio input and output, such a device could be a solid niche seller. It is also hard to ignore all of the deals that Apple is making in the video content world. I would bet that we find out something about their future plans at this year’s WWDC, as there are too many leaks and reports for nothing to be happening soon. If their video streaming content play includes a strong tie-in with the Apple TV, an intelligent home theater speaker setup with HomePod tech would be a great value add. Like the HomePod, this would be another opportunity for Apple to gather usage data to focus and improve these products, as well as feedback for their machine learning initiatives and to help improve Siri. It is smarter for Apple to stick to their core fans while they do this, and wait to make a broader mass-market play down the road, if and when Siri is better prepared to take the lead role on a small HomePod-like device. The key here is that a larger modular speaker or home theater-based speaker would likely garner positive reviews from both the tech press and users based on Apple strengths, despite the fact that Siri continues to be a work in progress. This is a feat that a HomePod Mini would be very unlikely to accomplish in the short term. As such, I hope Apple will pass on a few quick bucks now in favor of a better device with bigger sales and happier users down the road.